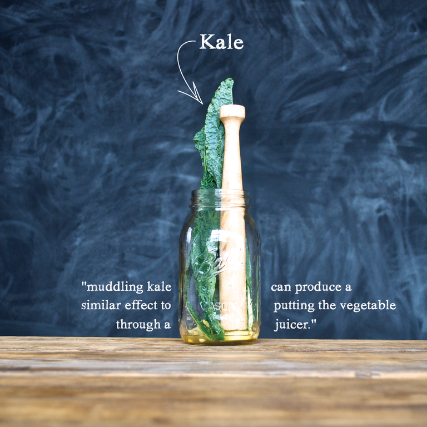 Start by muddling 3-4 large leaves of organic kale in your Mason Shaker - add in the lemon juice to make your job easier. Keep grinding until you've reached a paste - or until your arms get sore. Add in the apple cider, ginger and sugar (if desired) and mix. Put the top on the Mason Shaker, add ice (if desired), and shake away. Additionally you can shake without ice, and simply serve through the built-in strainer on the rocks. Either way it's sustainable goodness in a glass.